Anyone with adult acne is probably well aware of the countless solutions being offered out there, from over the counter topical cleansers, to natural remedies, to prescription drugs. Because we live in a consumer-culture, we’re often directed to throw products, and money, at our problems, whatever they may be. With ads and commercials telling us what we need to do more of, it’s easy to overlook one very important question: what’s not working for my skin? 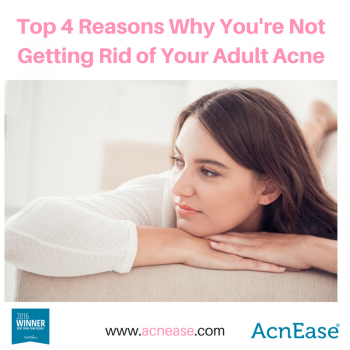 Much in the same way that using water to put out a grease fire will only make things worse, thousands of people looking to treat their acne end up reaching for the wrong solutions, which can often exacerbate the problem, leading to prolonged symptoms! We’ve compiled a short list of reasons that we, as skincare experts, often witness from people frustrated with their own regimens. If any of these sound like you, don’t fret! We’ve also got a solution for every misstep that will hopefully get you rerouted, and on the right track toward clear skin! You’re using too many products. This is probably the #1 reason most people aren’t getting rid of their acne - product overload, and honestly, we can see why. With hundreds of products marketed to improve symptoms created by other products, the over the counter skincare game is almost designed to keep you guessing and spending, but that just doesn’t need to be the case. If you’re looking to topicals, keep your routine simple, and try one thing at a time. A cleanser and moisturizer are cornerstone skincare products, so start there before adding fancy tonics and serums. Consistency is key, so give it a fair shot before throwing in the towel and moving on to something new. You aren’t checking the ingredients. Different people are sensitive to different foods, climates, and noise levels, and each person’s skin is no different - it likes what it likes! Just because salicylic acid works for a friend, doesn’t mean it’s meant for you. This tip can mostly be attributed to some old fashioned trial and error, but if you notice your skin doing really well on glycolic acid, stick with it! (just keep in mind, drying agents like glycolic acid can dry the skin, creating more skin oil which contributes to more acne). An all-natural honey mask doing the trick for you? Keep it up! Like the saying goes, “If it ain’t broke, don’t fix it!” Additionally, certain ingredients are just not intended for most people struggling with acne-prone skin, so taking an extra minute to ensure that your topical treatments and/or makeup are made of non-comedogenic, paraben-free, fragrance-free, and (often, but not always) oil-free will usually make a big difference in the appearance of your complexion. You’re not taking an approach of prevention. Most people with acne wait until the problem arises before treating it. Because the cycle of acne, known as the acne cascade, actually begins internally weeks before symptoms may appear on the surface of the skin, the only real way to treat the problem is to target it at its source. Acne is usually caused by a hormonal imbalance, which triggers the sebaceous glands to produce an excessive amount of sebum, or skin oil. This excess oil can become clogged within the pores, leading to breakouts. In order to prevent acne, several approaches can be applied, including the implementation of an anti-inflammatory diet, and keeping stress levels as low as possible. Although, like topical treatments, neither of these things actually work to address the problem at it’s source. By creating a buffer between the hormones and sebaceous glands, you need a treatment solution that actually prevents acne from forming before it starts. AcnEase is actually the only non-prescription that does this! Best of all, it’s all natural and 100% safe for everyone, meaning no harmful side effects or sun restrictions, and with several different regimens designed to address the severity and type of acne in your specific case, you’ll be sure to find a solution that’s best for you. If you’re feeling frustrated with your skincare routine’s results, it’s ok. You can take a step back, take a deep breath, and take a look at what has, and hasn’t been working for you, and make adjustments accordingly. When it comes to implementing change, a positive attitude can make all the difference, so remember - you deserve clear skin you can be happy with, and you CAN achieve your goals with a little perspective, and some practical knowledge of what works for your skin. What acne treatments have you tried again and again that just don’t seem to be working for you? Do you know what type of acne you have, and have you found anything that works for your skin? Tell us in the comments!